HomeBetting ExchangesBetdaq Versus Smarkets? Which is the better betting exchange? Can’t decide between betting exchanges? 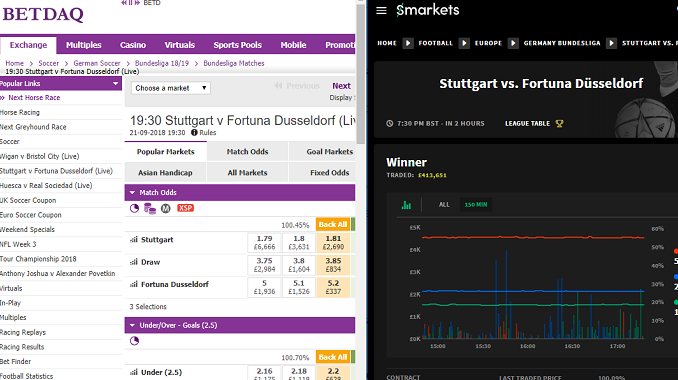 Our handy quick fire side by side comparison of Betdaq versus Smarkets should help you make a more informed decision for your sports trading. BETDAQ or Smarkets, where’s your smart money? Betfair might be the largest betting exchange, but two horses are trying to close up on the rails behind. BETDAQ and Smarkets have enjoyed different starts in life, but their offerings are not dissimilar and will be familiar to Betfair regulars. How did BETDAQ and Smarkets get started? BETDAQ was originally part of the Global Betting Exchange group of companies founded by Irish businessman Dermot Desmond in 2000. It started trading in 2001. In 2013 it was acquired by Ladbrokes, and then became part of the enlarged LadbrokesCoral group in 2017. BETDAQ is now the second largest betting exchange (first is obviously Betfair) in the UK and the largest betting exchange technology provider in the world. Smarkets was founded by American Jason Trost (see our CEO interview here) with a merry band of investors, opening for public trading in 2010. Several rounds of funding followed and by March 2015 the business had reached $1 billion in trades. It unveiled a brand refresh early in 2018 and received much press for its model of having a self-managed workforce who all get to see and vote upon each other’s salaries. What sports do BetDaq and Smarkets cover? BETDAQ has a wider range of sports markets, covering: football, horse and greyhound racing, golf, cricket, tennis, American football, darts, rugby union and rugby league, basketball, ice hockey, baseball, boxing, mixed martial arts, Australian rules and F1. While Smarkets is the only one to cover handball, it has a narrower selection with football, horse racing, American football, baseball, basketball, boxing, cricket, darts, ice hockey, mixed martial arts, motorsports and both rugby variants. Smarkets likes its politics, offering markets from Brexit to who the next Prime Minister will be and the US election results. You can even bet on whether Donald Trump will be impeached. There are also some television and entertainment markets, such as likely winners of Strictly Come Dancing. BETDAQ sticks to sport for its traditional exchange markets, but it does have a casino offering the usual range of slots, table games, together with arcade games and virtual sports. It has popular sports pools syndicates to join. BETDAQ and Smarkets both charge 2% on net winnings in any market. More promotions are available at BETDAQ. For new customers, pick one Premier League team and get five £10 risk-free bets across five matches. Both BETDAQ and Smarkets offer slick and regulated platforms, including mobile apps. BETDAQ has the wider range of sports, promotions and a casino, but Smarkets offers non-sporting exchanges, including politics and entertainment.